When Joanna Rowsell Shand, then thirteen, decided to take on a challenge set by representatives from British Cycling visiting her school, she didn't realise that decision would change her life. In fact, she was mainly motivated by the prospect of escaping a double maths lesson. As it turned out, Jo's power output was off the chart - the highest ever recorded for a female of her age, and she was quickly talent spotted for the junior cycling team. Not that the journey between that moment and Jo's subsequent status as a setter of multiple world records and a double Olympic champion was plain-sailing. 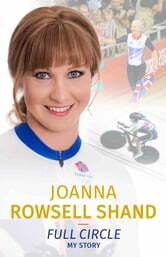 With no cycling experience, Jo was well behind her peers who had been prepped for life on a bike since their infancy. In addition, Jo was - and remains to this day - a very shy girl, not least because of her condition, alopecia universalis, which took her hair from her just as her teenage years were about to strike. This is the story of how she battled her insecurities and doubts, as well as judgement, and even ridicule, from people around her, to became one of the most successful and respected athletes of her era. All of which, she accomplished without compromising any of the essential good-heartedness and optimism that characterises her. If you have ever been tempted to believe 'nice girls finish last', let this book disabuse you of that myth. If you have ever felt your anxiety, social awkwardness or lack of body confidence has held you back, Jo's story will motivate you to realise you are so much more than the labels people find for you. Football Its a Minging Life!